You must make reservations at least 5 minutes in advance of the time at Ah Sing Den. 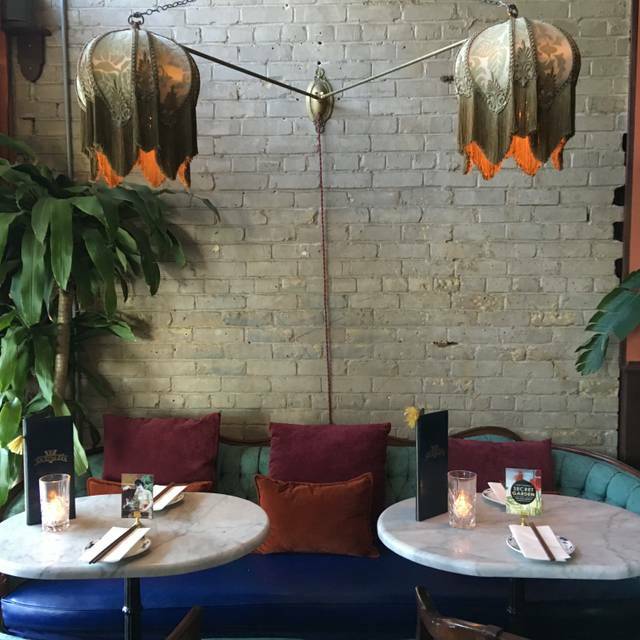 Named after Ah Sing, the owner of one of East London’s most famous opium dens where Charles Dickens, Arthur Conan Doyle and other creative people derived inspiration. We hope by bringing you the most delicious tipples and morsels your imagination will flourish as well! We tried to like this place but unfortunately it was a fail. The food is mediocre, a scallop dish with only two scallops was $20 and not even good, and the menu lacks creativity and depth. Save you $150 for a better restaurant. Everything was OUTSTANDING!!! Will go again when I’m back in Austin. Loved it. Great food and drinks. Ambiance is super cool with awesome music choice. Great Staff! Awesome food options! Unique environment! I have been wanting to try this place for months. We decided to go to their happy hour. The waitress was not attentive or knowledgeable of the menu at all. We talked to the waitress about wanting to do the half priced drinks and ultimately decided to do the "dealers choice" which the bartenders makes you a drink. The waitress did not know or decide to tell us that it was excluded from happy hour pricing so we paid $18/drink instead of $6. We then said we wanted to try a lot of different items and order multiple rounds of food. We placed our first order for appetizers. An hour goes by and we finally flag down our waitress and she had not even put our order in. Due to this, we did not have time to order more rounds of food or drinks and we were still late to our next stop. Ultimately, the place was really great and the food was good but it was very frustrating with how bad our service is. Absolutely fantastic! Our service was amazing!! Food and cocktails were incredible! Great value for the experience. Food is delicious. Great decor. However, servers and management were not accommodating. They were inattentive, and some were flat out rude. Will not be back. 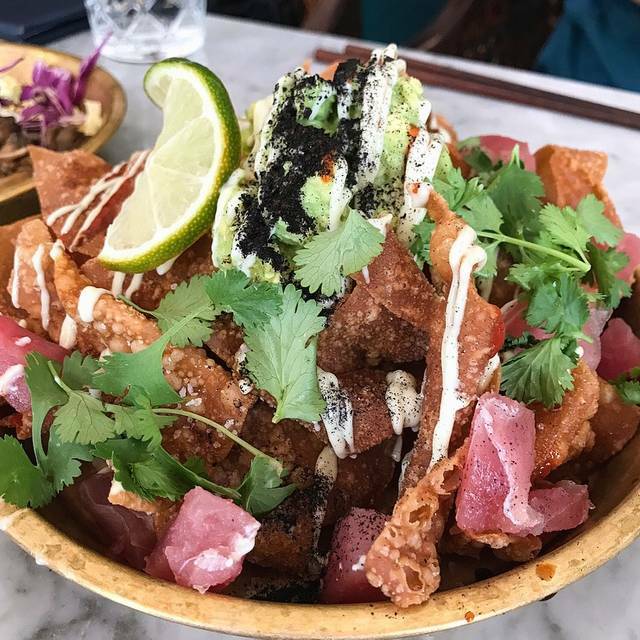 My husband and I tried the restaurant after seeing it on a local food bloggers Instagram and checking out the menu thinking it would be a great anniversary dinner. I loved the vibe of the place, the plants, decor, chairs, intimacy, were all amazing and as we were seated we were so excited. We each ordered a speciality cocktail. They were out of the Japanese whiskey my husband wanted and he went with the rec of the server for another drink. Neither of us liked ours, no big deal, chalk it up to personal preference. We started with the goat cheese rangoons and ceviche. We were disappointed in both, the rangoons had a drop of goat cheese in them and were just fried nothingness for the majority of the Rangoon. The sauce that accompanied them was amazing. The ceviche was 90% pineapple, we were literally digging around trying to find the scallops. At this point we contemplated leaving and having dinner elsewhere but decided maybe we ordered wrong and let’s try some other stuff. We put in an order for a bottle of sake, the cowboys and the mussels. The waitress came back 10 minutes later and asked if we needed another drink, we told her we were waiting on the sake which she’d clearly forgotten. No big deal she brought it right out . The cowboys arrived next and the pork belly wasn’t warm, maybe that’s how it’s supposed to be but it wasn’t good. 15 minutes later she asked if we wanted anything else, she’d forgotten our mussel curry. Never once did she ask about how everything was. Finally we got the curry and it was the only good dish. There were multiple mussels which hadn’t opened in the cooking process which I would have thought would have been removed prior to serving but I figured she’d asked for it rushed since she forgot it and maybe they didn’t take to time to do that. The broth was excellent and I was happy we had 1 thing that we liked. Overall, I felt like we wasted a lot of money and it ruined our night. 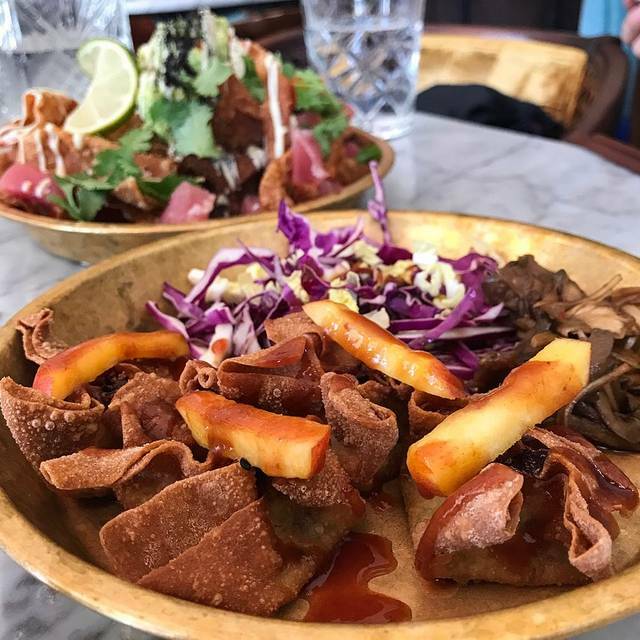 Cool vibe and great shareable plates to suit your appetite. Nice happy hour drink deal doesn’t hurt. Servers were friendly and laid back. I prefer a touch of neglect rather than helicoptering. Service was terrible. Food took entirely too long and is mediocre and overpriced. My new favorite spot - I just wished that it was noticed on my RSVP notes on OpenTable that it was Kelsey’s birthday. I was hoping for dessert or a birthday mention at the table. Restaurant has a decent concept and could be successful under competent management. For now, expect extremely slow service, priciness, and a menu where half of the dishes are not available. Decent atmosphere and good location. Absolutely loved everything about Ah Sing Den! The atmosphere was incredible, the food and drinks were awesome, and the service was great. I highly recommend this for a late night cocktail, date night or girl's night out. Cannot wait to go back! Host was the worst and ignored the order that diners arrived regardless of the fact that I had a reservation. When a dish came without the noted ingredients (note eggplant tempura should probably have eggplant in it), we were asked three times if we wanted it removed from our bill and then it was still there when the check came. Our waitress was really sweet, but I could see how poorly management was running this restaurant. I would go back for the drinks, but not worth staying for food. Great drinks and food tastes good but tricky to eat chips and ceviche without making a mess...needed extra utensils. Lovely ambiance, great service, cool drink menu. We were planning on dinner but it was more of a tapas place. Next time I’ll know just to come for cocktails. The food was comprised of small plates, which were a little pricey considering the portion size. Good thing the food was tasty, otherwise we would have left in total dismay due to the noise level being unbearable! We sat in a booth facing the front window and couldn’t carry on a conversation without almost yelling while repeating ourselves several times. We were ready to get up and leave when the food arrived. We ate our small plates quickly and left with throbbing heads craving some peace & quiet. The ambiance is quite cute & funky, just unfortunate the noise level takes it off our list for future dining. The food was pretty tasty, but also pricy for the serving sizes. We tried the goat cheese rangoon, thai curry mussels, and the fish and chips with beer cheese. The food was all around DELICIOUS! Been wanting to try Ah Sing Den and it didn’t disappoint! The atmosphere is exactly as they describe on their website. The food and drinks were great. Wonderful way to kick off new year’s eve. Authentic south East Asian cuisine. We came here on a double date last Saturday - highly recommend. There was so much attention to detail from the ambiance to the fresh cocktails and the menu. We loved it and we’ll be back! great space! good decor, service, and very unique. Under staffed, no manager visible helping server that was clearly super weeded. Waited 20 minutes for drinks, even though the bar was empty. Out of multiple things we tried to order food wise, but the server would only let us know they were out of things after we ordered them. One of the worst restaurant experiences I've ever had. 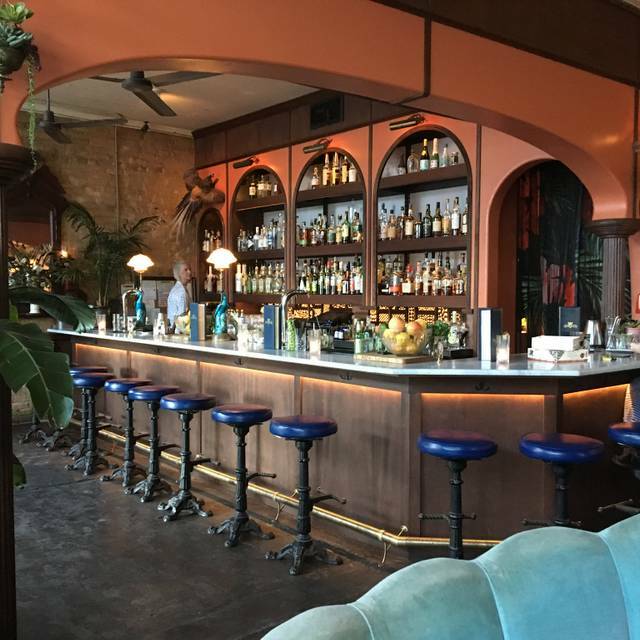 This is one of the most beautiful restaurants in Austin! 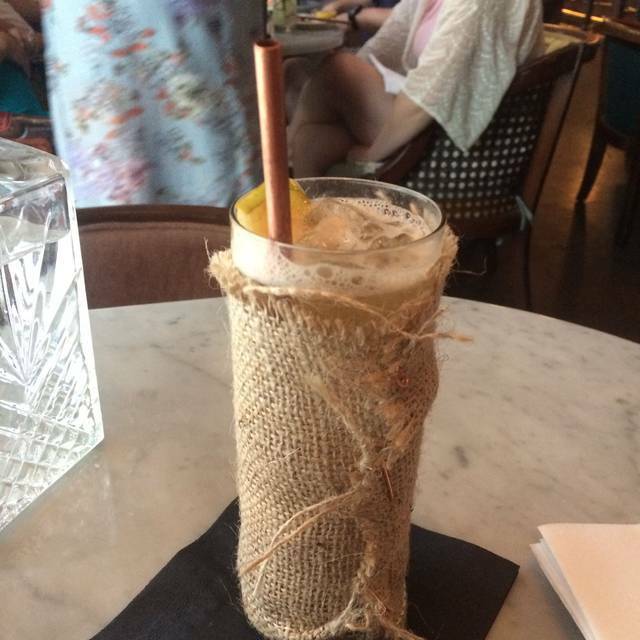 They have a fantastic menu and their drinks are unique and tasty. The service is great and friendly! Very romantic and fancy without being pretentious. LOVE LOVE LOVE! Wow this place is great. Love their dumplings and Thai chicken wings. Cozy and cute. 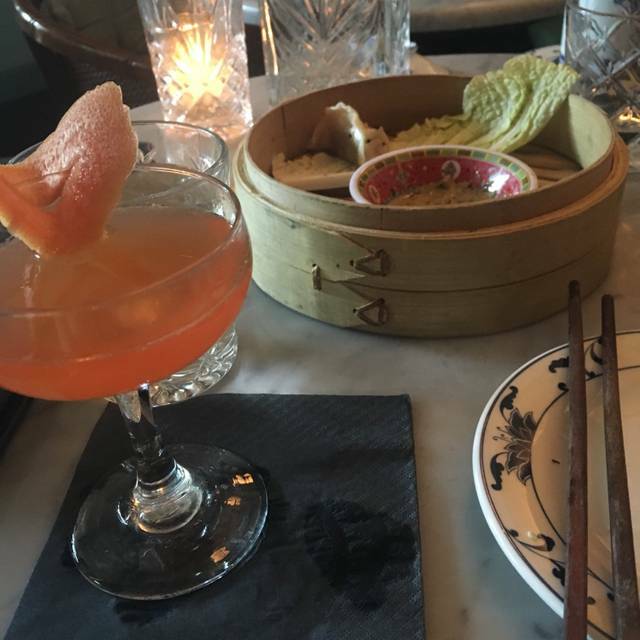 I have been to Ah Sing Den many times and have always enjoyed my drinks and experience. I took my family visiting from out of town here before a show on Sat night for a couple pre-show drinks. I made a reservation for 6 at 7:30. When we arrived, we were seated promptly but at 3 tables side by side instead of a round table, so no one on either end could hear the other end as it was so insanely loud. Looking at the cocktail menu, it seemed like there were more whiskey/bourbon cocktails than normal and there was really only one cocktail that sounded good to me (definitely not their fault). However when I ordered that drink, I was told the pear puree for the drink hadn't been made yet. That was kind of annoying since this was prime time, 7:30 on Sat. I decided to ask for a recommendation for another drink. I don't think our server had any idea what anything tasted like or what she was doing. Her recommendations/information about the cocktails and wine were way off and everything was "good" when someone asked about it. The cocktail I ordered was not what I wanted, so I gave it to my husband and opted for a glass of wine. I ordered the sparkling rose and when our server finally came around with the drink, it was the still rose. Apparently she mixed them up between tables. It was fine, but unremarkable. For my second drink, I asked for a glass of the Cotes De Gascogne and what I received honestly tasted like Bota Box Pinot Grigio. Not good. She never came to check on us or ask how we liked our drinks, we had to wave and flag her down every time we wanted another drink, and it took her 20-30 min in between when she came by to grab empty glasses off the table w/o asking if anyone would like anything else. My stepdad inquired about a few gins which they did not have, so he ordered a couple beers and both times they just brought out the can on a napkin, not even a glass to drink it in. What? How tacky. I'm sure this was an off night, but this makes me reconsider coming back. Love this place! The cocktails are great and the atmosphere is really unique. I have no idea what happened, but we should have been able to tell this would be a subpar spot since it was the only place with reservation availability downtown during Halloween weekend. The shishito peppers and chicken wings came out quick and hot, and then it was like our waitress completely forgot about us. Most of what we ordered was seafood, and it came out late and room temp. We ended up spending 2 hours there overall. Another server finally took over, but she wasn't much help either. We finally gave up. The decor was truly perfect and the pictures do not do it justice. I loved the use of plants, lights, and varied high quality glasses and dishes. This place has great ambience and interesting drinks. Great for HH for a small plate and an inspired cocktail. GREAT quality and quantity of food-- so many vegetarian options!!!!! The food is clearly well planned and thought out. I loved the way it was all displayed, tastes very authentic, right amount of spices, full of flavor; I left fully satisfied and more! Nothing seems thrown together, everything seems carefully designed-- seating, lighting, glassware, food, the way the food is served, the backyard patio and fountain, etc. Highly recommend. Try everything on their new menu!!! 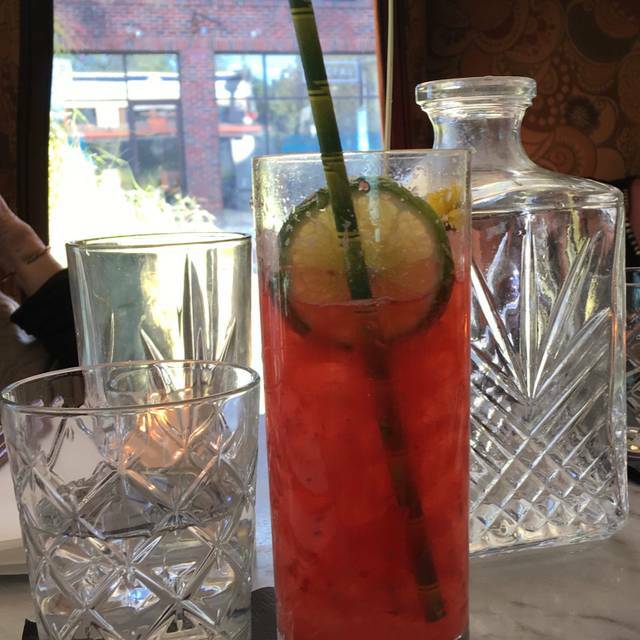 Excellent cocktail menu and small plates. The ambiance and atmosphere are unique and cool. This place is adorable first of all! They decorated this place so well. The drinks were great. We ordered almost all of the menu since it's sharable plates and everything was delicious. Just a super unique and cool place to either get dinner or just drinks. The food was fantastic and the cocktails can’t be matched. I love the casual atmosphere. I have been to Ah Sing Den before, but it was only for drinks and dessert. I came on a first date here for a burlesque brunch. While the entertainment was great (I was really hoping for more than just two appearances during the two hours, though), the food was lacking. Our service was fairly slow, even though we were one of two tables the first 30 or so minutes we were there. I had the french toast, which was so burnt that not even the all spice chantilly could save it. Overall a bit disappointed with the food and service, but the drinks and ambiance made up for it.